I know that spring, this year, has been slow to arrive. And, even now, as we approach Memorial Day Weekend, the official start to summer, there are questions as to how warm it will be for those determined to load up their cars, friends and families for the annual trek to the ocean. Nevertheless, my thoughts are with them. The beach has been a favorite destination of my family for many years. The contemplation of summer brings me to one of the wonderful things about visiting the beach, which is the plethora of flat ground upon which to ride one’s bike. Flat land translates into easy biking. 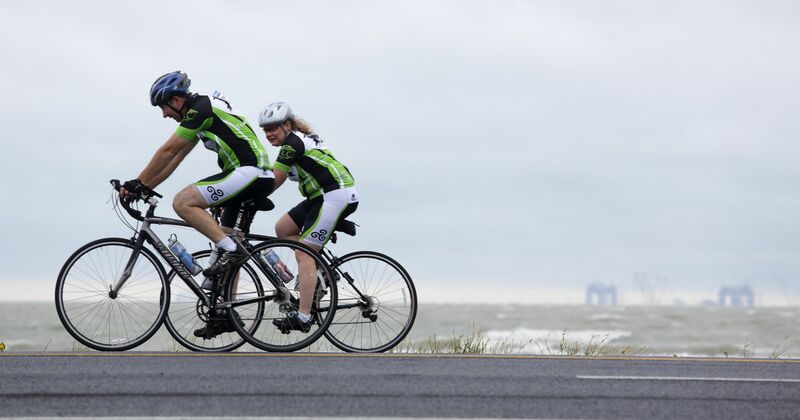 In Rehoboth Beach, Delaware (which is where my family usually goes) there is a wonderful flat stretch of highway with a wide bike lane running from Dewey Beach toward Bethany Beach. I recall one afternoon many years ago making the trek from Dewey Beach toward Bethany. It was not easy going. My father, a far better biker than myself, continued to urge me on. I pedaled. The wind, that afternoon, blew in my face and I bent my head to the ground. No summer breeze was this—this wind, I determined, this was an unfriendly, antagonistic wind. This wind was not my friend. The bike seemed to fight me every yard of the way. I plodded on. “The afternoon bike ride my father had encouraged, I decided, was not fun.” But, at this point, there was no turning back. I pedaled, complained and pedaled and complained some more. I was, after all, a teenager. “It will get easier.” My father insisted. I confess, I did not believe him. I continued complaining, grumbled a bit and continued on. At last, we neared a bridge and turned toward home. At this point everything changed. The wind’s disposition was abruptly replaced from an antagonistic fiend to a merry friend, pushing me along—barely did I even have to push the pedal. My bike verily skimmed the road like the sailboats at sea. It was glorious. By the time we neared the house, what had begun as an arduous ordeal had changed to a glorious joy. Here’s the thing…if you were riding a bike into the wind, and then stopped and turned around, you might think the wind changed because it went from hindering you to helping you. In actuality the wind didn’t change, you did. That’s something to think about on the feast of Pentecost. Because I think the Holy Spirit works a good deal like the wind. When we are determined to fight the will of God in our lives, every move we make is like a person pedaling into a strong wind—it is miserable, slow going. It’s like swimming into the current. There you are, working as fast and furious as you can, and any ground you’re gaining is far outweighed by the frustration building in your spirit. Now, I should clarify at this point and say, that I don’t think that when things are difficult this always means that we’re working against the Holy Spirit. Sometimes hard work is just that—hard work, and it is building up rather than tearing down. A person training for a triathlon endures great physical challenges in order to prepare for and reach a goal; a student working on a degree labors for years so that they might begin a career. A glassmaker endures a good many cuts and burns learning his or her craft. This is hard work for a reason. Yet, it bears consideration—when something is difficult, and the effort brings neither joy, reward nor a greater sense of purpose—well, then it’s time to pause, reflect, and consider. Are we working with God, or against the will of the Holy Spirit? In other words, when things are challenging, it’s good to ask ourselves: Are we pedaling into the wind for a purpose? Or, is it time to take stock, turn around and shift focus, and go where the Spirit leads? The Holy Spirit is known by a great plethora of names. Here are some of them: Advocate (one who takes your side), Truth-teller (someone whose words you can always count on); Testifier (someone who speaks up for you); prover and Judge (Someone who can see what is right and make it plainly known); Guide (someone who knows the way and is willing to show it to you); Speaker (of the words of God) and Glorifier (of Christ). Here’s something else about that Spirit. It cannot be manipulated. If you’re walking with the wind at your back, the Spirit moves you along with ease. If you’re determined to go the opposite way that the Spirit wants you to go—this will make itself plainly known as well. The Spirit of God is powerful, and no-doubt operates on its own timetable and in its own mysterious ways—but when it is present, there is no mistaking it for what it is. There’s something wild and untamed about the Holy Spirit. As we discover in today’s lesson from the Book of Act, doors cannot keep it out. It doesn’t deign to knock. Repercussions of the Spirit are unexpected and mysterious. People speak in tongues, and behold, they understand one another. The ways of the Spirit defy human knowledge—we’re left with symbols of leaping tongues of fire and the breath of God, of doves and wind, to comprehend. One thing is certain—you and I, we cannot control the Spirit—it eludes our grasp. There is no taming or turning the winds of the Spirit, you walk with it or against it at your own peril or pleasure. The Spirit and the will of God are one. The wind of Pentecost can take many forms. Sometimes it is a gentle wind that freshens and cools. At other times the wind of Pentecost rises to a gale force, threatening to rip shingles from our roofs. There are winds which provide sailing currents for birds and butterflies and others which knock down walls. Whatever type of wind from the Holy Spirit we encounter—we rest in this knowledge—whether we are challenged to ride its wildness or bask in its comfort, we can always be at peace knowing we are following the will (and the wind) of God. In Jesus’ name. Amen.